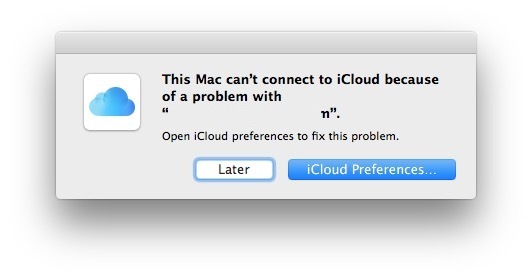 Some Mac users may encounter an error message stating “This Mac can’t connect to iCloud because of a problem with email@address.com”, which then directs the user to open the iCloud preferences. Once inside Mac iCloud preference panel, some users may be able to successfully login to iCloud, but often another error is encountered here which states “An unknown error occurred” when trying to login to iCloud on the Mac, or sometimes the iCloud preference panel freezes up and spins endlessly. Once these two error messages have been encountered, the Mac will typically be stuck in an infinite loop of iCloud login failures with an endless unknown error and the endless “problem” pop-up message, which prevents all iCloud functionality from working on the Mac including Messages, FaceTime, Notes, Mail, Contacts, Calendars, and all other iCloud related abilities. This set of iCloud unknown errors and problems is not exactly rare (see 1, 2, 3) and can be notoriously quirky to resolve, but the steps below should remedy these type of iCloud login issues on a Mac if they are seen. This is a multi-part series of troubleshooting steps that will resolve most iCloud connection issues on Mac. The first thing you should do is check if iCloud is down or not by going to https://www.apple.com/support/systemstatus/ and confirming that all Apple online services are available. If iCloud is down, you will need to wait until it is back up again before being able to resolve the issue. Quick side note: if iCloud was down but is now back up, there may be a lingering connectivity issue due to caching or otherwise, in that case proceed with the steps below and you can likely resolve the connection difficulty. Next up is to quit out of every app that is using iCloud, this includes quitting Messages, quitting FaceTime, Calendar, Notes, Reminders, etc. Be sure to quit the System Preference app as well. If the apps are stuck or not responding, go ahead and use Force Quit on the apps to exit them. Once all of those apps have been quit, go ahead and restart the Mac as usual by going to the Apple menu and choosing “Restart”. If the Mac is frozen or refusing to reboot, you can do a forced reboot as well. When the Mac boots back up again as usual, don’t open any iCloud apps yet, instead first go to the iCloud Preference panel ( Apple menu > System Preferences > iCloud) and attempt to login to the Apple ID / iCloud account again. At this point the iCloud login should proceed as usual, in which case using Messages and FaceTime should work without incident. You will likely need to re-login to iCloud when the Mac reboots. You can also log out and back into iCloud if things are still not functioning correctly to regenerate new Account data files. If you know iCloud is online, you quit all iCloud apps and rebooted, and you are still having difficulties, you’ll want to log out of iCloud, reboot, and then log back in. Go to the  Apple menu and open System Preferences, then choose iCloud. Select to “Sign Out”. Reboot the Mac as usual. Once the Mac has booted back up again, return to the iCloud preference panel, and login to the Apple ID as usual. That should be enough to fix the iCloud “Unknown error occurred” problem and the pop-up message stating the Mac can’t connect to iCloud because of a problem with the Apple ID. Did this work for you? Do you have another solution? Let us know in the comments. I have been extremely reluctant to log out of iCloud as you say because when I try to do so I get the alert: If you sign out of iCloud, you will need to create a separate password for this Mac. What? Another password to remember and for no good reason whatsoever? Why will Apple not let you simply log out and log back in using your Apple ID. Totally agree Bob Gerard… in fact I’d rather not use iCloud at all for any of my computers or devices… how can I get rid of that? The only way to get rid of iCloud is to never use iCloud, and then log out of iCloud. Your Mac will be missing many abilities by doing so. Or you can try to use Mac OS Snow Leopard which did not have iCloud. Sierra is full of iCloud so the new versions are reliant on it. Logging out of ICloud worked for me. The password thing was no big deal, the warning was just a bark, not a bite. I was able to still put in the same exact password that I use for my MAC itself, but then the next day it came back, so did it again. This time the procedure was different. I had the option to save (Copy), not lose all my stuff. So it was archived into IClouds>>GO>>>HOME. And I tested it by SHUTTING down, not just RESTARTING, because that made me think it worked the previous day. So anyway, shut down a few times. Then shut down, went to lunch with my Wife, came back, booting it back up, Problem gone. BUT>>LOL>>Once again, being shut down all night, last night (Why would that be different), I booted up this morning, and it was baaaaaaaaaack. I give up, DON’T CARE, because it is some sort of FALSE POSITIVE, because I have zero problem getting into ICloud from my MAC or a Non MAC machine. I believe that it is an Apple issue, that they need to resolve with some sort of update!!! In my experience was the “two factor authentication” for AppleID access to cause the problem. I turned off and everything is back to work perfectly! Now I log regularly in with user and password. This is exactly the difficulty I am experiencing. I have tried all the above several times without success. I believe the issue is related to our having to changed our primary e-mail address. The system constantly refers to an e-mail address that has not existed for a year or more. I have changed every reference to this “bad” address I can find. But, I am still on this endless loop of can’t connect pop-ups. Pretty much at the point of having to bring system down to Apple and pay for a fix. That’s the exact same problem I am having. I have a gmail email now instead of earthlink. I have changed it everywhere I can think of, but the system on my MacBook Air always refers to the old earthlink email. Did you ever find out how to fix that? Signed out and rebooted over 20 times, with no joy. Apple help chat was, as expected, ZERO help. I can access from iPads, phone, MacBook, but not the iMac. I’m having the same problem. It’s telling me that I have to log in, which I can’t do, to then log out. None of this has worked for me. Running Sierra 10.12.2. Changed iCloud pw when I dropped 2 factor auth. Now on every boot, I get this “can’t connect” message. Signed out of iCloud then back in and it duplicated every calendar entry. It all seems like lousy QA of Sierra and Support has no clue. This post was a life saver. I came across this problem when I changed the password of my apple ID. I could no longer sign in to my icloud account through my computer nor with my iphone. In the end “Removing iCloud Configuration Files” worked perfectly for me. “If you turn off iCloud Drive, all documents stored in iCloud will be deleted from this Mac. Does this mean information in Numbers and Pages will no longer be on my computer? I am reluctant to do this. I checked the console (type “Console” in your dashboard) and cleaned up the logs. Afterwards I tried to logout of the icloud account (or re-enter the password, it doesn’t matter). Then I finally saw the problem: the logs said, that the sqlite database in ~/Library/Accounts/Accounts4.sqlite was corrupt! This error message didn’t help me much with google, but then I took the same files from my timemachine backup one month ago and replaced them. I restarted the laptop (it didn’t switch off, hang at a black screen, so I forced it to). After restarting, the error came once more, but then all mail-accounts, calendar entries, reminders etc. were back again! I also could re-type my passwort for the icloud account and everything is working now! Hope that helps someone having the same problems. How do you clean up the logs. When I go into Dashboard, there isn’t a place to type “console” … it’s just the calculator etc. How do I “clean up the logs” in console? I constantly have to reconnect and re-set up iMessage across my devices. It used to only happen when I updated os and iOS. Now I get the error message multiple times a day and have to re-set up connectivity between devices. Very frustrating. I’ve tried every other fix. Removing files from “~/Library/Application Support/iCloud/Accounts/” solves my problem. Thanks a lot. Tried this, they were all in Trash. Did a full shut down, back up. Problem persists. I tried all that Sign out of ICloud stuff two days in a row, yesterday the second time, saving (COPYING) all my ICloud stuff to ICloud’s>>GO>>HOME. Appeared to work yesterday, after several SHUT DOWNS & reboots. But then after being down all night & rebooting this morning, IT’S BAAAAAAAAAAACK, but I no longer care, because it is some sort of phony whatever, because I have NO PROBLEM access ICloud on this MAC or a non MAC machine, either, a FALSE POSTIVE, some sort of Apple issue, IMO, that they need to resolve with some sort of update!! I was having same issue and i noticed my date and time was not up to date..i set it and evry thing working fine now. none of these worked for me. I can sign in to icloud fine on my iphone and apad and at icloud.com, but can’t on my mac since upgrading to high Sierra. no access from my mac to my calendar events, but they show up fine on iphone. I have deleted icloud plists several times, changed password several times, turned off 2 step verification, booted in safe mode and tried to sign out and in again, but nothing works. Apple doesn’t know how to solve it. Tried this. Eventually got the msg that it could not log me out. Since then, I HAVE LOST ALL THE ENTRIES in Calendar!!! All my appointments, etc. What a f..@! suggestion! A real piece of sh*i*t! Just because a suggestion may work for someone else it doesn’t guarantee that its going to work for you? Also if you are that concerned about calendar appointments you should have backed up first. Thank you! This worked for me: logged out of icloud and logged back in. What a relief! 1. Making sure I was signed out of iCloud, iTunes store, and App Store. 2. THEN I logged in with a totally separate iCloud ID that I created for temporary use. 3. Then I signed out of iCloud and signed back in with my ORIGINAL, preferred iCloud ID. Worked like a charm. This looks promising. I am in my primary profile which has the subject problem. iCloud seems to be fine from any web browser, from a Test profile on this laptop, and from my phone. I am concerned about my local keychain in this profile that can’t connect to iCloud. If I do your steps above, do I stand to lose one or the other keychain? iCloud has been around for a while, it was first rolled out with OSX 10.7 in 2011. It has now been 6 years and Apple still hasn’t gotten it right. iCloud has always been a headache, through every update, and barely worth using. I wish the geniuses at Apple would erase iCloud and invent a system that actually works. “Log out and Back in to iCloud” worked for me! Man, I was struggling with this all day. Not only was iCloud breaking on me, but all my connected internet accounts (Google, Facebook, etc.) and all apps that use those APIs were breaking. Fantastical, Messages, Calendar, Reminders, everything was broken. OK, I yet SIGNED OUT of ICloud AGAIN, third day, this time clicking on SAVE my stuff, to be able to Continue, I immediately hit CANCEL, then CONTINUE, since I already had it all archived at ICloud’s>>Go>>Home. This time I also set up that 6 digits security code for Keychain, even though I will probably never use that, know what it really is, or care, LOL, and had to provide a CELL # for SMS verification if needed. Used an spare cell we have, used to be my Wife’s before she got an IPhone on our son’s Verizon Family plan. I have SMS shut off on MY CELL. Anyway, SHUT DOWN, turned it back up. and it did not come back. Probably will tomorrow morning for whatever reason :-). Maybe cause I use CCleaner each evening before shutting down, but have all along and never has been an issue, until just a few days ago. All these solutions are a bunch of bolony, IMO. I did the, “Library,” thing, never worked. I did the Sign out three days in a row. Appeared to work at the time, testing it with several RESTARTS, and even several, total SHUT DOWNS, then re-boots. and it doesn’t re-occur UNTIL THE NEXT MORNING, just now, today, IT’S BAAAAAAAAAAAACK. IMO this is an APPLE problem AND NEEDS TO BE ADDRESSED, maybe with some sort of update. Logging out of iCloud and restarting worked for me! I give up. It is not affecting my accessing ICloud’s files, folders, etc. on THIS MAC, or a NON Mac machine too. A False Positive of some kind, IMO. You wrote: “Bless you this worked!” What solution worked for you? Thank you so much it worked! Let us know tomorrow morning if it STILL works. I went through that three days in a row, and after testing, by RESTARTING several times, and on day two and three, doing several full SHUT DOWNS, and re-boots, thought it was solved each time. But then after the MAC was SHUT down all night, upon its’ morning re-boot, guess what, it was BAAAAAAAAAAACK, LOL. So I have given up. It is some sort of PHONY issue, since I can access my ICloud, folders & all files, just fine from this MAC as well as a NON MAC machine. Samo Samo this morning. I wonder if moving up from MacOS Sierra to High Sierra, may solve this, since Apple appears to not to care???!!! Well latest news. I was on MacOS Sierra, 10.13.2 and was not wanting to go to HIGH Sierra 10.13.3. A friend of mine who is a BigAppleFanBoy, was convinced that after trying everything else that upgrading the OS would fix it. Once again, after getting ER ALL DONE, and re-booting, etc. it looked like MAYBE, but again again after being SHUT DOWN all night and just re-booting, IT’S BAAAAAAAAAAAACK. My friend at first thought that something had changed with my MacID sign on ID, which I use a Gmail addy for that, but I feel it is an Apple issue not a Gmail issue, that appears to be even beyond Apple’s Tech Support expertise. From what I have read on other sites, they have NO CLUE. Incidentally, my friend does not have this issue on his MacPro. Mine happens to be a MacMini. I used the “Quit All iCloud Apps, Reboot the Mac” and it solved my problem of my iCloud account password not being recognized and getting an error message of “An unknown error”. Be sure to follow all the directions and close all apps that use iCloud like Mail, Messages, etc before restarting. Removing documents from folder, signing out of iCloud, plus a reboot worked for me! Thanks for the help! Nearly two years later, and still relevant. Thanks, the quit-and-restart method worked! I did the “shut down” and restart method. I was then able to login to the iCloud on my Mac. Photos taken on my iPhone are now updating on my computer. I restarted the computer and it helped. Furthermore, my other accounts are working too now. Another trick is to remove the mac account on ‘other devices’ on your phone’s icloud account. Worked for me. This problem was so maddening, and I *scoured* websites to find a solution. Did the terminal commands to adjust "shared folder access rights", Library tweaks, log out/in, try a fresh/temp iCloud id, restarts, restarts, restarts, blah blah blah. All to little avail. That made it able for me to successful log out of iCloud. But then nothing would log back in, as I then got the "verification failed there was a problem connecting to the server" error. After that, VIOLÁ! I could login to iCloud and all was right with the world (well, with my Mac anyway). Note: when one resets NVRAM (first step above) it will "disable" any Find My Mac setting (unless you have a firmware password), so be sure to turn this back on once you reestablish your iCloud login, etc.